Andrew Gribble just posted Auburn’s depth chart under the heading “Auburn releases depth chart, doesn’t surprise anyone with anything,” and while that’s a slight exaggeration, it ain’t that far off, either. If you and I had sat down and drawn out what we expected Auburn’s two-deep to look like, we wouldn’t have been more than a few players off. 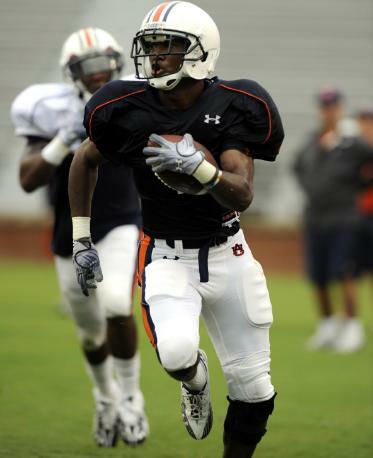 –First and foremost, Trovon Reed listed as the third-string H-back and left off of the receiving three-deep entirely. Uh … did anyone think he was even practicing at H-back? With, you know, Eric Smith and Shaun Kitchens and kinda-sorta the Swede Killa? What gives? Here’s my theory: we know Reed has the capacity to line up just about anywhere: outside receiver, slot, Wildcat QB, and–yeah–even H-back. But he’s not a starter at any of those positions and can’t be listed as such. But he’s also not the backup, strictly speaking, because if player A went down with injury, Player B Who Is Not Reed would take over most of the snaps. Plus Reed maybe isn’t a guarantee to play at all, thanks to his injuries. So they decided to just slip him in the depth chart wherever they could, and oh look, here’s an open spot under H-back. Whatever the depth chart says, if he’s healthy enough to play, I’ll still be somewhat stunned if someone like Kitchens or Jay Wisner sees more snaps than Reed. — While the defensive depth chart answers a few vague lingering questions–it’s Fairley and Clayton at starting tackle; yes, Etheridge is the planned starter over McNeil; yes, Harris Gaston and Jake Holland are neck-and-neck in the backup MLB race–it’s 99 percent chalk, right down to the “OR” between Jonathan Mincy and Chris Davis in the dimeback slot. — Aside from the Reed shenanigans, the biggest surprise on offense? No Antonio Goodwin. We might expect to see Carr and Benton behind Zachery, but Jay Wisner (OK) and Derek Winter (say wha?) behind Darvin Adams? When the next thing we hear Trooper Taylor says about Winter will be the first? If Goodwin’s this far down the pecking order, why isn’t he on the scout team? Maybe it’s an injury thing. Or maybe it’s a “he’s only been working at the Z, but we didn’t want to leave Benton off the chart entirely” kind of thing. In any case: I’m thinking Adams, Zachery, Carr, Wisner, and Reed are the only guys we see take meaningful snaps on the outside until proven otherwise. — Hey, “Son of” Jorrell Bostrom made the two-deep, sharing backup right guard honors with Cooper. Meaning that as much effort as Chizik and Co. made to overhaul the o-line in the offseason, we’ve still got two walk-ons on the second string. All right! Also worth noting that rather than list Chad Slade as the third right tackle, Chizik and Co. left him off the depth chart entirely. He’s done well to avoid scout team duty, but unless both Isom and Greene share simultaneous injuries–and maybe not even then–he’s still probably headed for a redshirt. — Despite the “OR,” Chizik has said that Ryan Shoemaker will punt against Arkansas St. No surprise there. I thought I did read somewhere that Goodwin was dinged up. That may explain things. Although, it is a bit disconcerting with all the weapons we thought we had to see such a huge drop off after Smoove and TZac. He missed a day of practice; I didn’t think it’d be enough to put him behind Winter, at the very least. I don’t think it’s really that much of a drop-off … Carr and Reed should be far better than what we had behind them last year, anyway. I just think of Wisner as a scrappy edge blocking WR, rather than a downfield pass threat. However, maybe that is what we need, since we keep saying we are a run first, play-action down the field team. If Kodi or the Wis are great a sealing the edge- -then we can live with just Tzac, Adams and then maybe Reed out of the H spot catching and running. At any rate, I’m ready for Thursday night to get here (the start of live college football), followed by a very speedy trip to the Plains on Saturday afternoon! I think the WR spot on the depth chart is pretty much interchangeable at this point, especially with how flexible Malzahn’s offense is. I really don’t think there’s any ryhme or reason outside of Zachery and Adams being the starting WR’s. The H-back is gonna consist of about 4 guys – Smith, Lutz, Reed and Kitchens, but as you noted, Reed can obviously move around to slot or outside WR. That’s a position that will change based on the situation and is very flexible. And at the same time, Kodi will play inside and out, but they just had to put him somewhere on the depth chart. Goodwin might play, but I honestly wouldn’t mind seeing him redshirted to keep building depth if we don’t need him this year. I don’t think this depth chart is set in stone either. We may see it changed after a few weeks. But I think the WR position, especially in this offense, is so flexible/interchangeable that several of these guys can really be moved to one or another WR spot on the depth chart, after you get past Adams and Zachery. I won’t be surprised at all to see Benton move up behind Adams in a couple weeks either. He did have a setback in camp, but it sounds like he’s really come a long way since last year and he’s got the tools to make it happen. And I think the OLB positions are kind of interchangeable as well. Roof has said several times that he wants those guys to know how to play both and I wouldn’t be surprised to see Freeman be the first guy to come in and sub out both Bates and Stevens. Totally agree, KG. With pretty much everything. I’m guessing Freeman can’t quite go this week, but starting against MSU, agreed that he’s the first guy off the bench.